This post is a little sentimental for me… four years ago I was in the early stages of my obsession with decorative baking… I was devouring every book, website and blog I could find on the topic of cake and cookie decorating. I had recently discovered a sweet blog called Bakerella and was always sure to check her new posts each and every Monday. 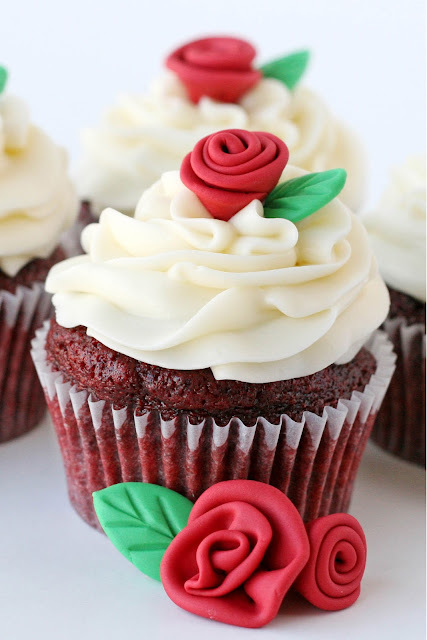 Monday rolled around and I found the most beautiful rose cupcakes I’d ever seen! That very day I pulled out my bucket of fondant and followed her instructions as closely as possible. I made a whole set of cupcakes and brought them with me to church group that evening. I was so proud of them! 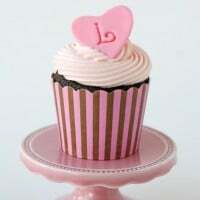 I was so pleased with the photos of my cupcakes that I made one of the photos my Flickr icon. To this day, it is still my icon. I love remembering the joy of successfully creating something new, and something I was proud of. 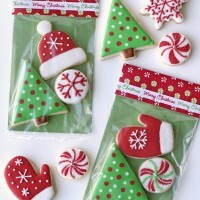 Bakerella gave me that gift four years ago (and many times since), and I hope that I have given it to you through some of my posts as well. 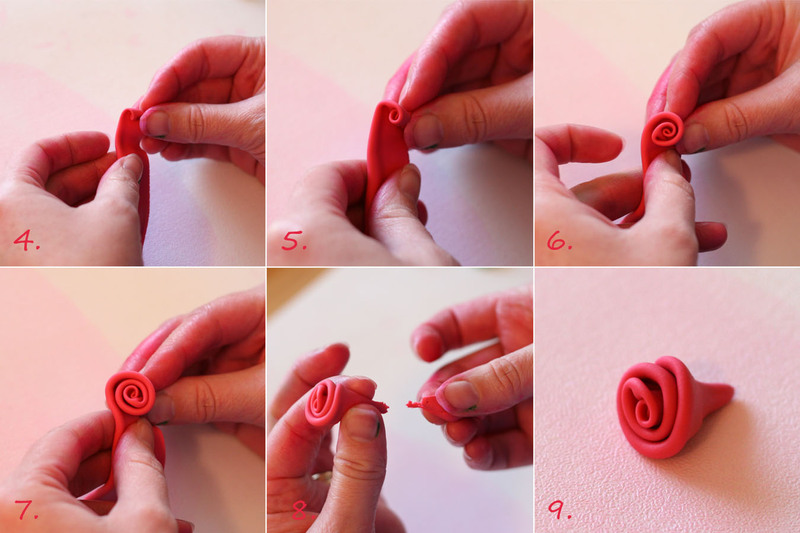 Anyway… would you like to make some pretty fondant roses? If you’re familiar with working with fondant, follow along below. 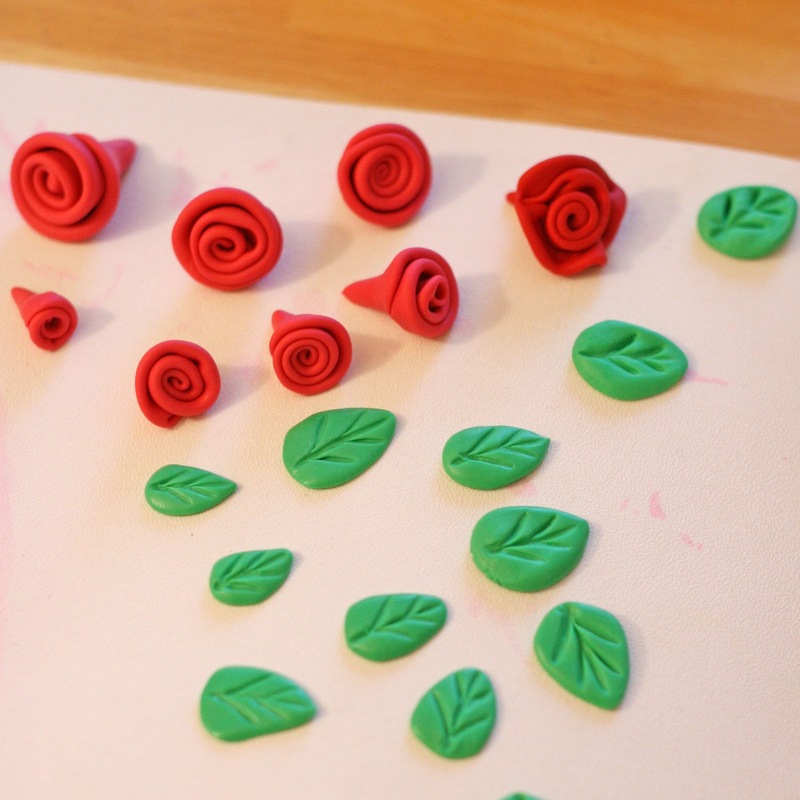 If you’re new to fondant work, I have a whole post titled Fondant 101 to get you started. To begin, color your fondant as desired. 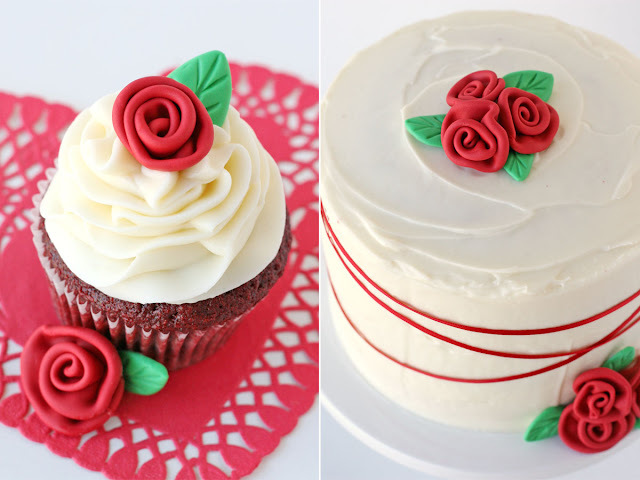 Red can be a hard color to create (from white), so I usually prefer to buy pre-colored red fondant if I want a nice true red. I was out of red, so this color is made from white. I used Americolor super red, a bit of burgundy and a tiny bit of purple. It’s also a good idea to wear plastic gloves while working with (especially while coloring) fondant. As you’ll notice below, I was out of gloves! 1. Roll out a small piece of fondant. 2. Cut a strip about 1 1/2-2 inches wide (in this case I used the piece to the left of my cut). 3. Fold the fondant strip in half lengthwise (as shown). 4. With the folded edge on top, begin rolling the strip of fondant around itself. 5.-7. Continue rolling, as you pinch the base of the ‘rose’. 8. When you’ve created the size rose you want (or have come to the end of the strip), pinch the base of the rose, and pull off any excess fondant. 9. Lay your finished rose to dry (2 hours minimum). I usually leave a bit of a cone shape at the end of the rose because it makes it easy to press into frosting on a cake or cupcake, but you could certainly cut it off if you prefer. As a bonus, Cake Journal (another gorgeous site I’ve loved a long time!) 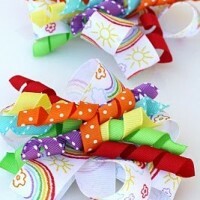 has perfect video showing how to quickly make ribbon roses. 1. Roll a tiny bit of green fondant into a ball. 2. Press the ball of fondant down onto your work surface. 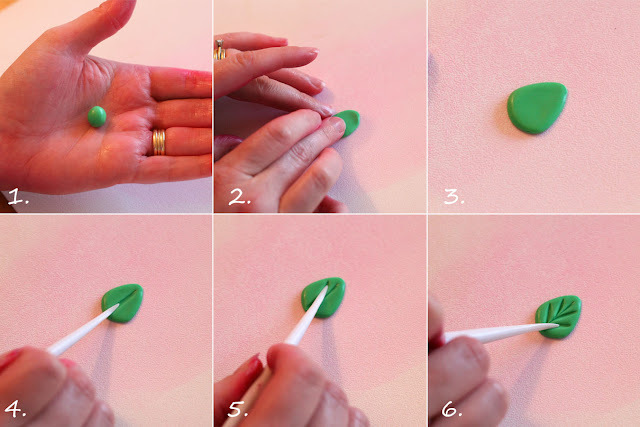 Use your fingers to press it flat, and shape it into a basic leaf shape (similar to a tear drop). 4.-6. Use a fondant veining tool (or the end of a small paintbrush) to draw veins on the leaf. Allow leaf to dry. You’ll notice quite a bit of variety in the size and shape of the roses and leaves (above). Some of that is just what the fondant wanted to do, some is my choice. Sometimes I like nice tight, ‘perfect’ looking roses, other times I prefer a more ruffled, loose look. Once dry, use your roses and leaves to decorate cupcakes or cakes (sneak peek of a cake below that I’ll share more pictures of later this week). I have just tried this, but after folding, I find cracks appear in the fondant. What am I doing wrong??? How can I resolve? 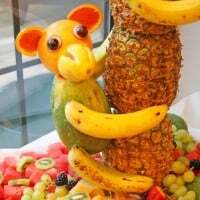 Woa this is so sweet.Looks easy but i haven’t tried it .I know that by the time i venture to practice it,am sure i will get it.Thanks a lot for the tutorial.